This is the thread for those of us that are serious about Ultra doing a water block run. Post your requests here. Don't forget to bring your wallet! #1, Is there any possibility of you going to micro pins? ie cut another set of channels perpendicular to the current ones for slightly better heat transfer. It's only a single block so I'd say the benefits of heat transfer outweigh the pressure drop created. Do you actually have the capability to do that with your equipment? #2, Also interested in an alternate top that uses machining in the top to equally distribute the flow across the block with two central ports for inlet and outlet on opposite sides of block but not diagonally opposed as they are now. similar to this Swiftech Apogee XL top design. http://i.imgur.com/ei6ljlJl.png Inlets located centrally, with a plenum chamber to spread flow across block so that all parts of block receive equal flow. Still not ideal but my OCD and aesthetics make me want a symmetrical block, but only if it can provide more equal flow than the current design. Also, what is the thickness of the cold plate ultra? have you tested a few different thickness'? say 6, 8, 10, 12mm cold plate? I'm curious to know the effects of it on sustained 100% CPU load with a thicker or thinner cold plate, I've always been a fan pf the thinner one but I just want to see the data on it. The best thing about about pins is this allows for center firing block like the apogee. 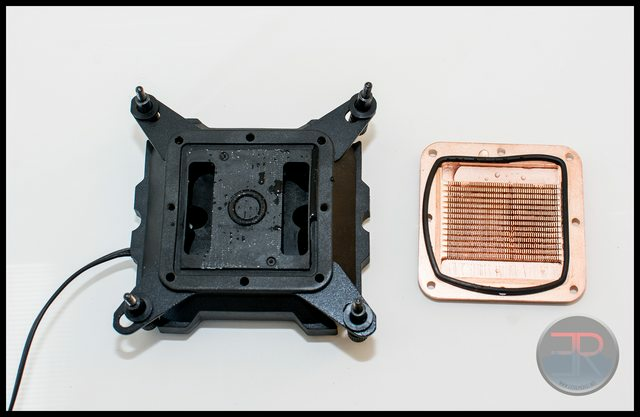 this results in the coldest water hitting the hottest part in a CPU block. It's also being forced down from above which is great. it is possible to make pins instead of slots BUT the big problem is i can only silt copper 80mm wide so the current block is to long to turn 90 and fit. Im not sure why you say the flow is un even? The flow is perfect across the block my block going to a center firing block would actually result in un even flow because the distance across the diagonal of a square is greater. This results i less flow in these areas. I assume you mean there's a temperature gradient across my block because cold enters one side and hot leaves the other. This is true. The obvious solution was to go to slots with a central inlet. This is a significantly more complicated top design. The down side of going to a center in was that this then more than doubles the effective slots area. This then more than 1/2 the flow rate down each channel. 1/2ing the flow rate down the channels is very bad because the block is huge as it is. In the end in all my sims i could make a center firing block that would perform slightly better BUT only if people could achieve the theoretical flow rate from a 655 V if they could not due to rads piping blaha then the performance fell of greatly. In the end in a real world situation having the greater velocity down the slots was a better design. I'm not well versed in waterblock design. I have had my CPU block apart and it utilizes a crosscut design like you mention Ultra. Yet my GPU blocks are designed like the V2 block that you have. CPU (8350) runs at 54c full load and the GPUs (R9 290) run at 46c at full load. Both work well. You mentioned that your machine is not able to do the pin design. Plus your explanations seems sound considering you've been doing this for awhile. Liam's idea of changing the top to even out the thermal distribution makes sense. Yet my visualization of the waterflow may be incorrect (wrong). If you do 1 slot in the middle where the water comes in with the fitting in the middle. and 1 slot at each end with the fittings on opposite corners. basically the same hole placement that you have on your 3 hole tops. Of course this is just an idea from someone that has no experience in waterblock design so please forgive me if this is a stupid idea. I can draw a picture if what I've described is difficult to visualize or even of you thing it might be a good idea. So does anyone have any input on if this thing can handle 600w? Ok, so pins are out from a machining perspective so it's good to have that settled. Plus you raise good points about rigidity of the block with pins instead of slots. Surface area of pins vs slots should be identical though, but only if slot width is symmetrical, ie the slot and the remainder are same width, like 0.5mm each, and then the corresponding slot to create the pins is the same on a grid pattern, so the pin loses the surface area from where the slot has been cut through, but gains it back from the sides of the pin that are now exposed, not perfectly because the back side of the pin won't really receive as much flow as the front and sides will, but the turbulence created and disrupting the laminar flow should overcome it. But anyway, it isn't an option so there is no point debating it. Channels it is. Have you got any revisions you want to make to the channels? What are the revisions you wanted to make to the block? My main issue with the diagonally opposed inlet is that the corners without inlet/outlet would appear to be starved of flow, particularly because you are using slots. Now I know that your block is elongated (you said something about 80mm in slot direction) that helps a bit as you have 9mm either side of the 62mm TEC for the flow to spread out across the block enough so that all channels are getting even flow, and the flow "dead spots" in the corners aren't over the TEC so it doesn't really matter. Perhaps after the slots have been machined could you use an end mill to create a cavity in the 9mm of slots on either end of the block that aren't above the TEC the full width across and the full depth of the slots so that all channels have a better chance of getting equal flow? If you've done the sims and it doesn't look beneficial then fair enough. I'd love to get my hands on the 3D model, but I may just model my own up to show my ideas more clearly. The temperature gradient across the block can't really be avoided so I'm not bothered by that massively, just concerned about any dead spots in flow that will create hot spots on corners of TEC, sounds like you have it covered though. What about cold plate thickness and the mounting method? Cypres' test on OCN appear to show the block handling up to ~800w heat load, handles ~600w better though(ie less TEC voltage resulted in lower CPU core temp). Total heat load of less than 400-500w would be ideal. if you put the bards opposite each other (in the middle of the block) this results in SIGNIFICANTLY worse performance this is because the water will take the path of least resistance which will be the shortest distance this is straight down the middle between the barbs. The only thing that encourages flow to not go down the center is the restriction of the slots. Since the block is large a lot can go straight down the middle meaning the sides of the block gets stuff all. If you have the bards in opposite corners then there is no shortest path as in theory the distance is equal no matter which slot the water takes. This ensures equal flow across all slots. Now the obvious next question is why dont i have the barbs in exactly the opposite corners cos based on the above this should be best. Well in reality having them in the exact opposite corners doesn't result in the best cooling performance. One of reason for this is having it slightly set in allows the incoming or out going water to not only go left or right but both directions. this is less restrictive. Also the block is bigger than the TEC so the edges dont need as much flow cos they dont have to cool as much. As for milling the chamber down this is not done because of base and fin rigidity. doing so would require ticker fins also im extremely worried about the base folding if all the extra copper is removed. you need to keep in mind that the slots are done with a slitting saw so the slots have a radius at each end removing this is a lot of copper preventing it from folding in 1/2 so it needs to stay. However i've obviously tested they idea and milling it out did not show any improvement cos frankly the camber at the end is huge the I/D pf my BP barbs is 10mm = 78.54mm where as the chamber in the block is 11mm x8mm = 88mm you could also say it has more than the 88 because the barbs are not in the corners so some can go left and some can go right so 176mm. Anyway you look at it the existing chamber is larger and restrictive than many other parts of the loop so is not a restriction. Lets cover the things that i know will improve performance. unfortunately there's a difference between drawing something on the screen and it actually being made. What happens is the slots are in reality larger than they should be and the fins are thinner than they should be. This happens because the fins are to weak and are bending into the cutter a small amount resulting in larger slots and thinner fins they they should be. You can actually see the fins getting thinner nearer the middle of the block where the lack support the most. So i will reduce the number of slots a bit to help stop this by making the fins thicker and therefore stronger . This is definitely happening in the next block as it will definitely improve performance and heat load capacity. The other thing to do to improve performance of the block is to make the base of the water block thinner (not talking about the cold plate here). But i'd like this to be an incremental change probably not made to this version of the block there though as im extremely worried about the reduction in rigidity of doing so. The other thing that can be done that will net a small gain would be to reduce the size of the end bolts from m4 to m3 thus the slots can be 1mm longer around them. It really wont make to much difference though. Although the best was 6mm i stuck with 7mm to be on the Conservative side. By the way for testing i actually modeled up a CPU with core and integrated heat spreader because the size of the load your trying to cool will greatly affect optimal cold plate thickness. Any other idea's welcome though i've tried everything i can thing of. I've just resolved part of the confusion on my behalf. I found the video of the version 1 of your 62mm Block, I can see the underside of the top in the video and it shows me that you have a cutout in the top to allow the fluid to spread sideways before it flows through the slots, I wasn't aware of what you had going on under the top so I was struggling to see how the fluid would flow sideways to the opposite corner of block from inlet/outlet to those "dead zones", I assumed you were just leaving like a 0.5mm gap above the slots to the underside of top for the fluid to flow sideways before it went through the slots, but that isn't the case, you already have the cutouts in the top that I was requesting with the centered in/out,but with diagonal which is fine, so I believe your method is as effective as what I was hoping to achieve. I get what you are saying with the diagonal in/out, equal flow paths and all, more inclined to accept it now I know what is going on on the underside of your top. I'm glad to see that result with the 6mm thick coldplate, its what I'd always thought, thicker may be better for maintaining cold temps under short CPU load spikes, but under sustained load a thinner cold plate is better provided it is thick enough to spread the heat from the die>IHS>Cold plate>TEC, which that 6mm appears to be ideal, and 7mm isn't even a compromise when we are talking 0.25*c haha. Very happy with that cold plate thickness. How thick is the hot plate? and how deep are the slots? How wide are the slots/fins? Quick question, when you do flow sims, do you use volumetric flow rate on inlet and pressure on outlet? Just want to know so I can run some proper sims. I used volumetric flow rate for inlet of 0.11m3/s, I wanted to use 0.094m3/s which is 5.67l/m or 1.5gpm. 0.11m3/s translates to ~1.7gpm, so still achievable with our pumps, where I'm lost is the pressure side, it asks for an outlet pressure, I used 31026pascals, which is like 4.5psi, which is approximately what a laing D5 at setting 5 would do. Now is that correct or totally wrong? I'm a bit confused about the PSI, because I got that 4.5psi off a P/Q chart for a D5 at 1.75gpm. Is that PSI on the P/Q chart the actual output pressure of the pump? And would this figure in turn have to be lowered to account for the pressure drop of the block being tested? EDIT: this is wrong. 1.5gpm is 0.000094635m3/s. I'll try that as inlet volume flow rate with 20684pa outlet pressure (3psi) sound better? Last edited by LiamG6 on Thu Nov 26, 2015 12:12 pm, edited 1 time in total.